Reverend Francis P. Duffy is one of the most well known chaplains from the First World War. He was appointed to the 165th Regiment of the 42nd “Rainbow” Division, formerly the “Fighting” 69th Regiment. Fr. Duffy had been a chaplain since the Spanish-American War. He was appointed chaplain of the 69th Regiment in 1914 and went to the Mexican Border in 1916 with the Regiment. In 1917, Fr. Duffy joined the Regiment at Camp Mills before shipping off to France in October 1917. He left a lasting impression on the men as he attended to their spiritual needs in the heat of the battle. His hard work did not go unnoticed as he became the most decorated cleric in the U.S. Army. Francis P. Duffy was born on May 2, 1871 in the Ontario Province of Canada. He graduated from St. Michael’s College in Toronto before entering St. Joseph’s Seminary in Troy, NY, where he was ordained in 1896. After Fr. 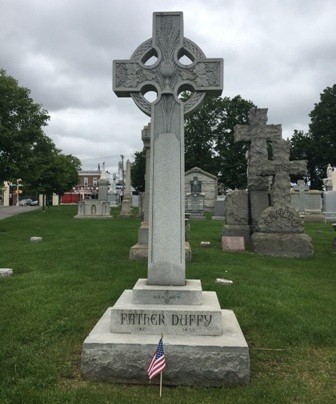 Duffy was ordained in 1896, he studied briefly at Catholic University before working with then–Auxiliary Bishop John Farley at St. Gabriel’s Church in Manhattan, followed by St. Peter’s Church in Haverstraw. In 1898, Fr. Duffy began to teach at the new St. Joseph’s Seminary, Dunwoodie. For the next 14 years, he served on the faculty as a philosophy professor. In the 1903–1904 academic year, he received an honorary Doctor of Divinity from St. Mary’s Seminary in Baltimore. Fr. Duffy briefly acted as a chaplain in Montauk, NY toward the end of the Spanish American War. He was stationed at the hospital there, where he greeted wounded men returning from Cuba. While at the Seminary, Fr. Duffy and a few of his fellow priests began a new theological journal, The New York Review, which was progressive for its time. The journal was founded in 1905 with the intention of discussing the relationship between science and faith and how the Catholic Church could reflect the changing times. While the journal was initially met with great enthusiasm, it eventually was discontinued in 1908 after it was conceived to be too aligned with modernist thinking for the Church. In 1912, Fr. Duffy was appointed to the new parish of Our Saviour in the Bronx. As pastor, he built a church, rectory, convent, and school. He even incorporated a special room for mothers to care for their babies and still attend mass, an innovation for its time. Within one year the new parish grew to one thousand members. Fr. Duffy was appointed chaplain with the 69th New York Regiment in 1914. However, as America had not entered the war in Europe, Fr. Duffy had little to no chaplain duties. Fr. Duffy presiding over a funeral in France. As previously stated, Fr. 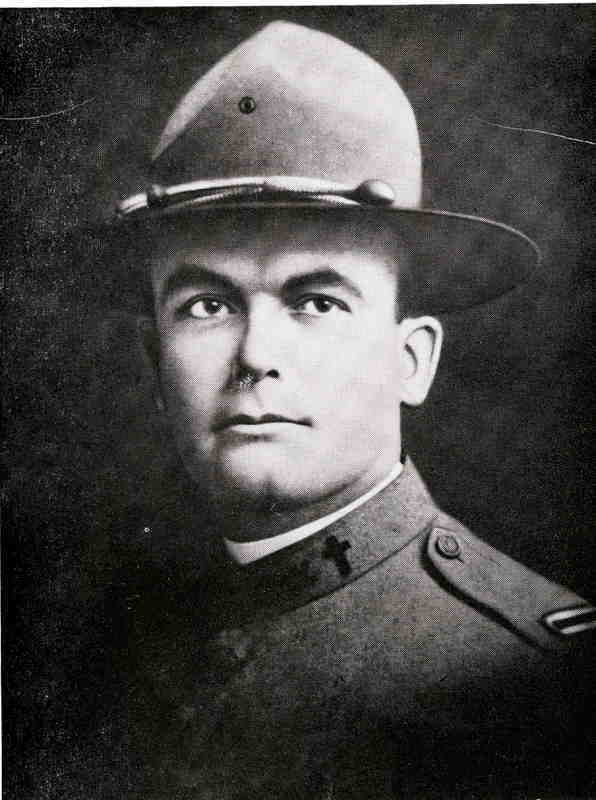 Duffy spent time as a military chaplain toward the end of the Spanish-American War and at the Mexican border with New York’s 69th Regiment in 1916. The 69th was stationed in McAllen, Texas for eight months, finally returning to New York in March 1917. Fr. Duffy briefly returned to Our Saviour Church while preparations were taking place for the 69th Regiment to be sent overseas. The Fighting 69th National Guard Regiment was officially federalized in August 1917 and became part of the 42nd Rainbow Division as the 165th Infantry. Fr. Duffy was their senior chaplain. Fr. Duffy documented his experiences overseas with the 165th Infantry in his diary, which was later published as the book Father Duffy’s Story. His commentary depicts life in the training camps and in the trenches. The book offers valuable insight to dealing with death, as the burial of fallen soldiers was one of his main duties as chaplain. Additionally, the army relied on Fr. Duffy to help boost the morale of the soldiers spread throughout the trenches and provide comfort to those who were suffering in the hospitals. In May 1918, Fr. Duffy was promoted to the rank of Major and was therefore the senior chaplain in the Division. Despite his new rank, he was able to remain with his regiment for the rest of the war. When they moved into the Champagne sector, Fr. Duffy was tasked with boosting the morale of the soldiers. Immediately he moved among the regiment “to get the men in the right spirits” for the impending battle. As the men moved toward the battlefield, Fr. Duffy stood watch and gave absolution as they passed by. The Battle of Ourcq brought numerous casualties for the regiment which Fr. Duffy buried. This was one of the hardest tasks he had as chaplain of the 165th Infantry. His recollection from this day expresses this “heartbreaking task” the best: “I knew these men so well and loved them as if they were my younger brothers. It has been the saddest day of my life. Well, it is the last act of love I can do form and for the folks at home.” Fr. Duffy’s hard work did not go unnoticed. On September 7, 1918 General Pershing awarded him with the Distinguished Service Cross. Though the war had officially ended, Fr. Duffy remained in Europe with the rest of the 42nd Division as it became part of the Army of Occupation. He had the opportunity to celebrate Christmas mass in Germany along the Rhine River where it was “celebrated peacefully and triumphantly.” Finally on April 21, 1919, Fr. Duffy and the Old 69th arrived home in New York harbor. They were greeted with hoards of well-wishers who were happy to see their boys home. Fr. Duffy marched with his fellow infantrymen in the welcome home parade along 5th Avenue. His Bronx parish, Our Saviour, also organized their own parade when he finally returned to their church. He had earned the nickname the “Fighting Chaplain,” and everyone was eager to show their appreciation. 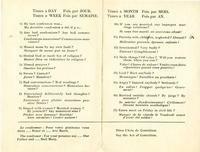 In December 1920, Fr. Duffy was appointed pastor of Holy Cross Church in Manhattan. It was an easy transition for Fr. Duffy, as so many of his fellow members of the 69th were parishioners there. Fr. Duffy was a source of comfort and inspiration to those re-adjusting to civilian life. One of his well known accomplishments at Holy Cross was the establishment of a 2:15 AM Sunday and Holy Days Mass for the night workers in the Times Square area. Fr. 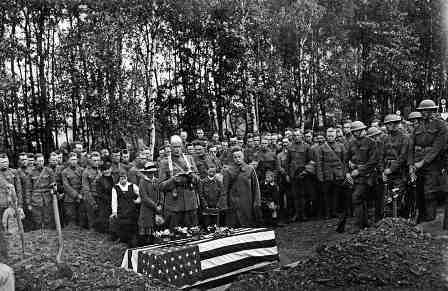 Duffy continued to speak at various memorials for the Great War and eulogized his fallen comrades until his death in 1932. On June 26, 1932, Fr. Duffy died at St. Vincent’s Hospital after suffering from colitis for three months. It was immediately decided that he would receive a solemn military mass at St. Patrick’s Cathedral as thousands were expected to attend. A procession of soldiers, veterans, policemen, and firemen accompanied Fr. Duffy’s body as it was moved from Holy Cross Church to St. Patrick’s Cathedral. Thousands of people waited outside the Cathedral to pay their final respects. Most Rev. John J. Dunn, Auxiliary Bishop and Vicar General of New York, celebrated the mass. Monsignor Michael J. Lavelle offered the eulogy. The procession then left St. Patrick’s Cathedral to go to St. Raymond’s Cemetery in the Bronx where he was finally laid to rest. At the time of his death, Fr. Duffy was the recipient of five awards for his military service: Distinguished Service Cross (U.S.), Distinguished Service Medal (U.S.), Conspicuous Service Cross (N.Y. State), Legion d’Honneur (France), and Croix de Guerre (France). Today a statue stands in Times Square honoring Fr. Duffy. It was erected in 1937, close to Holy Cross church, Fr. Duffy’s last parish. New York’s mayor Fiorello LaGuardia and other dignitaries attended the statue’s unveiling. The Archives is documenting Fr. Duffy's story with the creation of a Twitter account in his name. Click here to follow along.